Much of what has been written on the history of sustain­able fashion begins in the late 1960s, when the world was dropping out and tuning in. Disillusionment with materi­alism, mechanization, and most of all a brutal war, moti­vated a youth-driven raising of consciousness around the value of the planet and its resources. A love affair with Mother Earth led many to an unprecedented rejection of the fashion system. When the hippies shed their clothes, bought items second hand, and used flowers as accessories, they stopped the high powered fashion system in its tracks. As reliant on consumers buying newness as humans are on oxygen, the fashion system could not exist without designer clothes, fast trends, and big money, all of which the hippies rejected. What remained was an aesthetic; a look that the fashion indus­try struggled to imitate with luxe materials and couture techniques. The haute hippie became an awkward, mon­ied approximation of a reality that could not actually be bought in stores. Briefly, and for the first time in recent memory, the most eye-catching, inherently watchable person in the room was wearing a thrifted linen top, some patched up old jeans, and freshly plucked daisies rather than the latest runway looks. A subculture’s desire for something other than commercially produced fashion blossomed into a new mode that prized natural, organic, purposeful clothing. The hippies, however, owed a debt to some unlikely an­cestors. They were not the first ones to break ranks with predominant high fashion trends; a bold breed of beau­ties had come long before them. The history of rejecting the new in favor of the natural can be traced back to the middle of the nineteenth century, when the machine age was nascent. Furniture, wallpaper, textiles, and decorative arts of all kinds were increasingly produced by methods that sped up manufacturing. Innovation in industry meant that thoughtful design was losing in the battle of mass production. Even before the Industrial Revolution took deep hold, artists and makers were growing wary of their future. The remaining decades of the nineteenth century saw the birth of various design reform movements, each with a set of beliefs meant to curb the degradation of design. 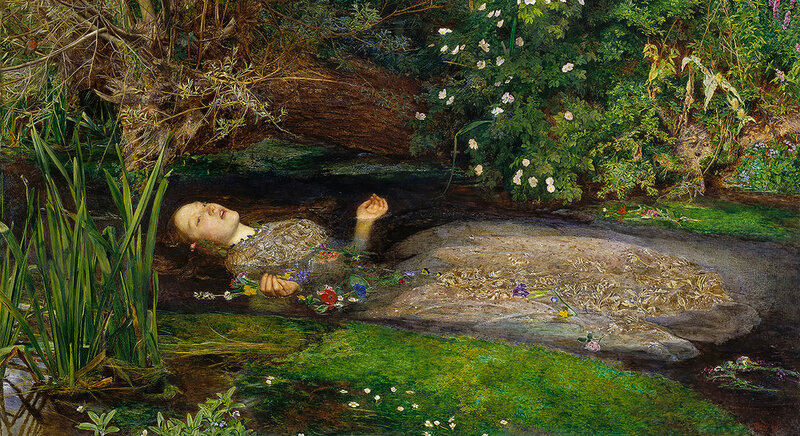 The Pre-Raphaelite Brotherhood was one of the first groups to take a strong stand against the industrial­ization of art. Three artists founded the group in 1848: William Holman Hunt, John Everett Millais, and Dante Gabriel Rossetti. The trio’s tenets centered on valuing nature and the craftwork of the artist above all. They saw the division of labor, an early precedent for the assembly line, as the death knell of the artist. They wanted things to slow down. They wanted artists to have the time, space, and means to holistically create superior objects based on nature. In the world of the Pre-Raphaelites, paintings of land­scapes and animals were strictly done outdoors and on site, in order that every essence of what they were painting was true to form. Details were bold, sharp, and distinct. Colors were brilliant. When painting portraits, Pre-Raphaelites employed live, sitting models. They studied these models closely, being sure that what their paintbrushes left behind on the canvas was real human beauty. Pre-Raphaelite models such as Jane Morris, Elizabeth Siddall, and Alexa Wilding were often lovers or wives of the artists who painted them. They were entrenched in the lifestyle of the artists, and many were artists them­selves. Their choices in dress were more than a question of artistic identification. Their garments gave them ease of movement to pursue their creative passions, a revolu­tionary idea. The women who adopted Artistic Dress saw it as a matter of physical and mental health. They sought to emancipate the waist from restrictive corsets. With their emphasis on nature, the Pre-Raphaelites saw corsets and bell-shaped, crinoline supports worn by fashionable women as deforming. To their eye, the rigid undergar­ments created an unnaturally shaped silhouette, one that was disfiguring and dishonest. The Artistic Dress movement also had an aversion to what was on the outside of fashionable dresses. Ruffles, bows, and other trimmings were seen as fussy and dis­tracting. Artistic styles featured cleaner lines, little embellish­ment, and a general softness. Garments were dyed with natural colorants. Vegetable and plant-based dyes gave the garments rich, muted colors in direct contrast to the emerging fashionable chemical dyes that were garishly bright. Beauty was natural. In Pre-Raphaelite paintings the women have a strong beauty. Their faces are intense; their features are bold. Subjects stare out at the viewer with a seductive, commanding presence. Lips are full and shapely. Eyes are wide and deep-set. Cheekbones are prominent. Noses seem chiseled out of Classical stone. The women in these paintings are uniquely striking—and that hair. In their time, the dominant, fashionable hairstyles were meticu­lously manicured, smoothed, braided, and often enhanced with tight, false curls. The women in Pre-Raphaelite portraits have natural, wild hair. Their manes are mostly unrestrained and let loose, like their garments. The texture and color, usually wavy and deeply rich, are expressive. It is a natural beauty, not subject to passing trends. It is timeless and true. The physical features of the models are as integral to the Artistic Dress movement as the clothes themselves. In concert the two create an example of some of art’s most lasting, timeless beauty. Ultimately contemporary sustainable fashion is all about time­lessness, quality of craft, a deep respect for nature, and concern for the well-being of those who wear it. These are important ideals, and alas, ones that are timeless themselves.